From the Coots collection by Westland Giftware. 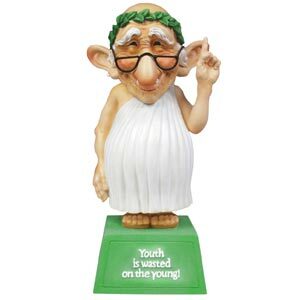 Coots Youth Figurine. This Item is in stock and ready to ship. You should not postpone your purchase and miss out on adding Coots Youth Figurine to your Coots collection! From the Coots collection by Westland Giftware. Youth Figurine Saying on base is Youth is wasted on the Young. The perfect gift for that Old Coot that you know and love. Constructed of solid resin measures 6 inches tall. The Old Coots Collection, Based on illustrations by artist Mike Dowdall. Westland Giftware Coots Figurines shipping from Canada. No Surprise Border fees or Customs!